A few weeks ago, I tagged along on a road trip to Kinderhook Farm, located a few hours north of New York City in Ghent, New York. The animals who live there are extremely well cared for. The visit was excellent for several reasons. 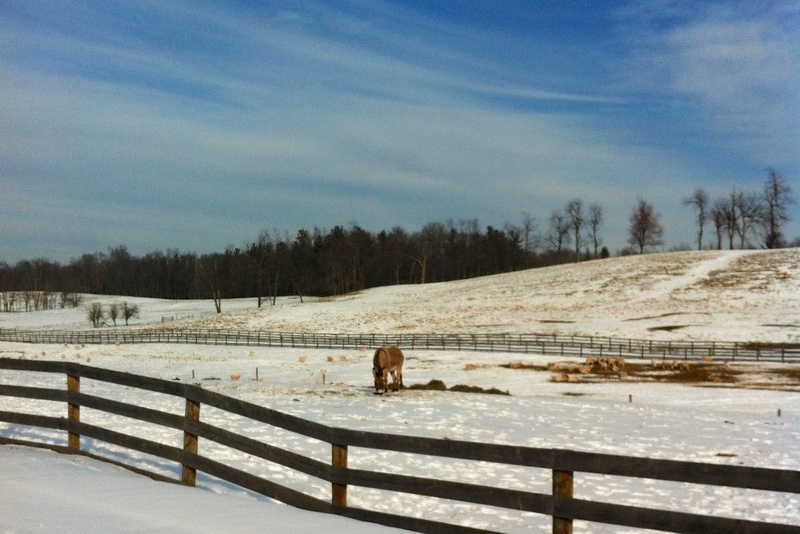 The farm is gorgeous: a mosaic of red barns, a trail of low wooden fences, bold against the white snow that currently covers the pastures. Heritage breed chickens roam where they will, producing eggs in shades of blue, pink, green, and beige. I was introduced to Luci the dairy cow, the only dairy cow on the farm and apparently a bit of a diva for it. (I also met Apple, poor Apple, Luci’s somewhat abused sidekick; it’s a love-hate relationship between the two of them.) A sea of sheep spreads across a field, guarded by a pair of Italian herding dogs, both animal’s coats the white of snow. The farmers who operate Kinderhook are impossibly friendly, gracious hosts. After touring us around the farm, we were invited into the kitchen for warm cookies, milk (courtesy of Luci, I cannot begin to tell you how tasty this milk is), and grilled cheese sandwiches. The kitchen’s bay windows look out past the barns and across the fields, over small hills dotted with trees that rise and fall as far as the eye can see. If it feels like I am romanticizing this farm, I’m sorry, but it’s no exaggeration. It was bucolically beautiful, beautifully bucolic, and the animals Disney-esque in their loveliness. The clean and quiet air proved an invigorating change from the city. Before we left, we nipped into the farm store, where I behaved like a kid in a candy store. I filled my bag with eggs, ground beef, these here lamb shanks, and a rooster. The eggs have been eaten, but the rooster is still in the freezer, waiting for his starring role as coq au vin. I really cannot emphasize enough how much I enjoyed our visit. This is a recipe for Sunday afternoon. It’s a recipe to spread across two days. (On the second day, all you have to do is pull the meat from the bones, heat the sauce, and boil the pasta, so it’s no inconvenience, really.) If you’re smart, you might double the recipe and freeze half, for some day you don’t feel like cooking. 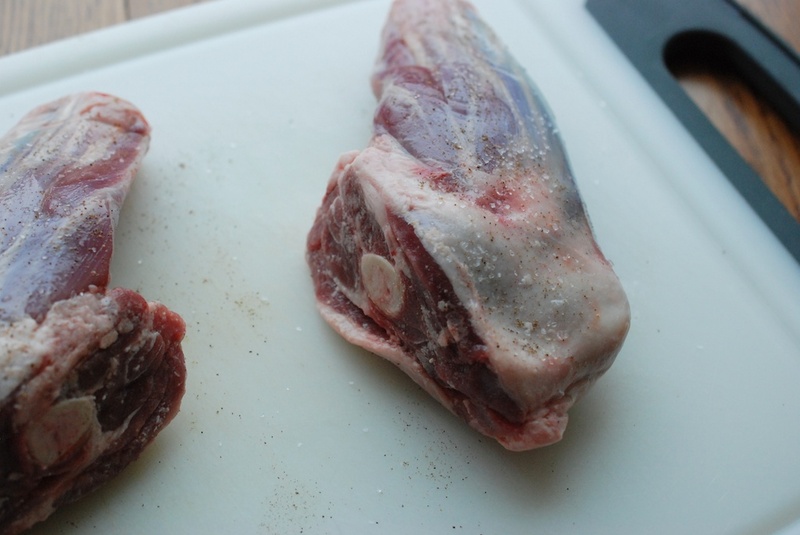 A note on the lamb: As usual, I urge you to buy the best lamb you can get your hands on. (For the record, the Kinderhook lamb is spectacularly good.) Even if you won’t be frolicking to a farm anytime soon, a great butcher or farmers market is a resource you can (and should) take advantage of. 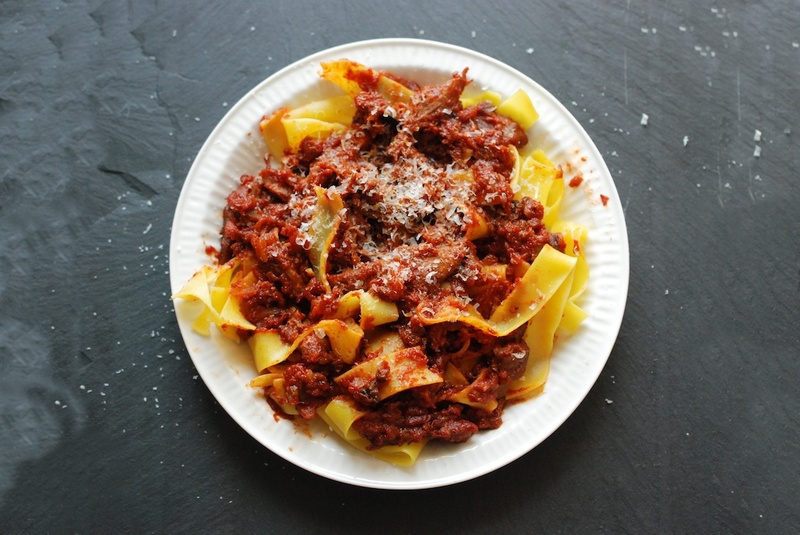 A note on the pappardelle: I bought mine from the supermarket, but by all means, feel free to buy it fresh or make your own. 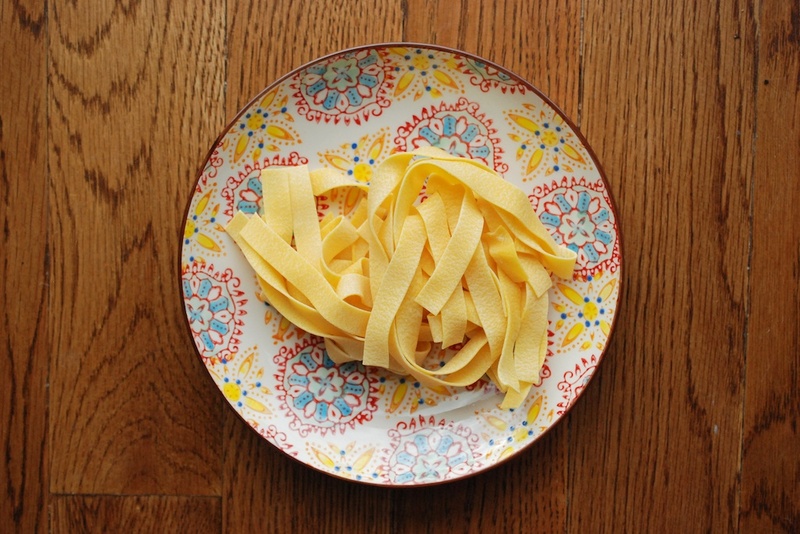 You can use another wide, flat pasta if pappardelle isn’t available. Ridged penne or rigatoni would also work. 1. Heat the oven to 325F. 2. Take the lamb shanks out of their wrappings, and pat them dry. Season them liberally with salt and pepper. 3. Heat the vegetable oil and 1 tablespoon of the butter in a Dutch oven (or heavy-bottomed pot), over medium heat. When the butter has melted into the oil and is bubbling gently, add the lamb shanks to the pan. Brown them on both sides, about 5-7 minutes per side. 4. 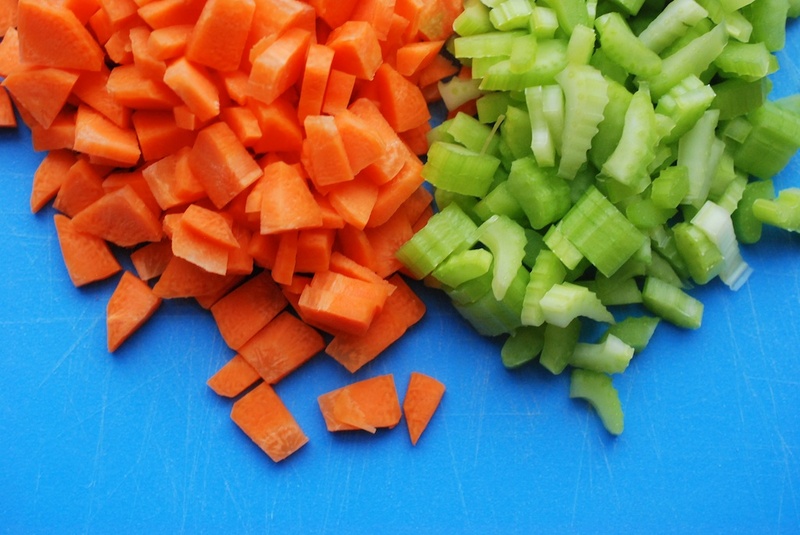 Meanwhile, prepare the vegetables: mince the garlic, finely slice the shallots, mince the onion, peel and finely dice the carrots, and finely dice the celery. While you’re at it, de-pit and chop up the olives. 5. 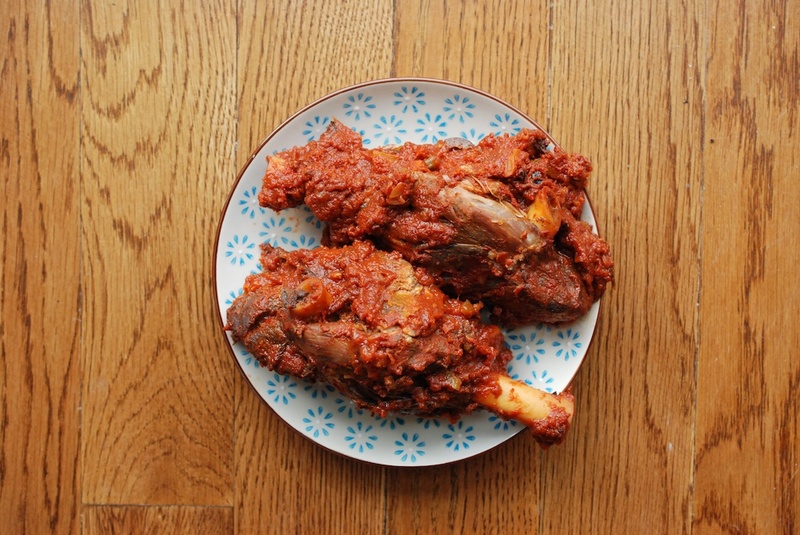 When the lamb shanks have been browned on both sides, remove them to a plate. If the pot is super oily, spoon a bit off, so that 1-1.5 tablespoons remain (I didn’t have to, but just in case). Add the garlic, and 30 seconds later, the shallots and the onion. Cook for 1-2 minutes, stirring as you go. Add the carrot and the celery, and cook for another 8-10 minutes, until the vegetables start to soften. Stir in the chopped olives. 6. 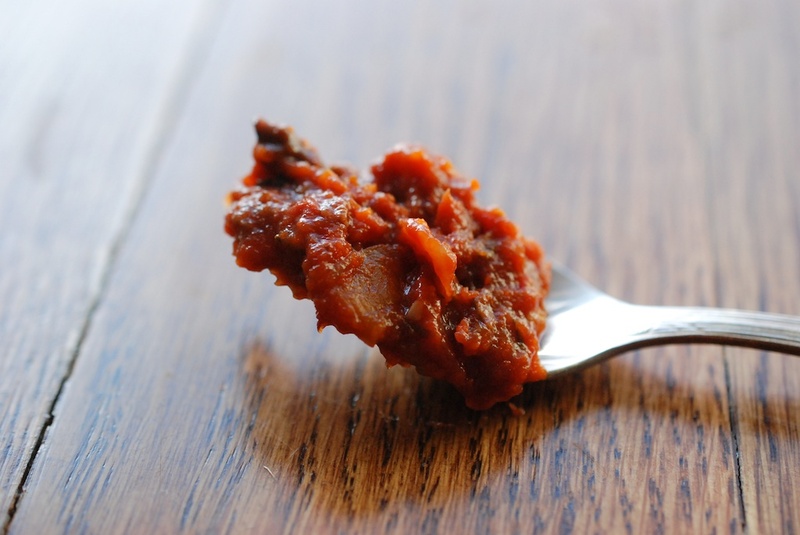 Add the tomato paste and the light brown sugar; stir to incorporate into the vegetables. 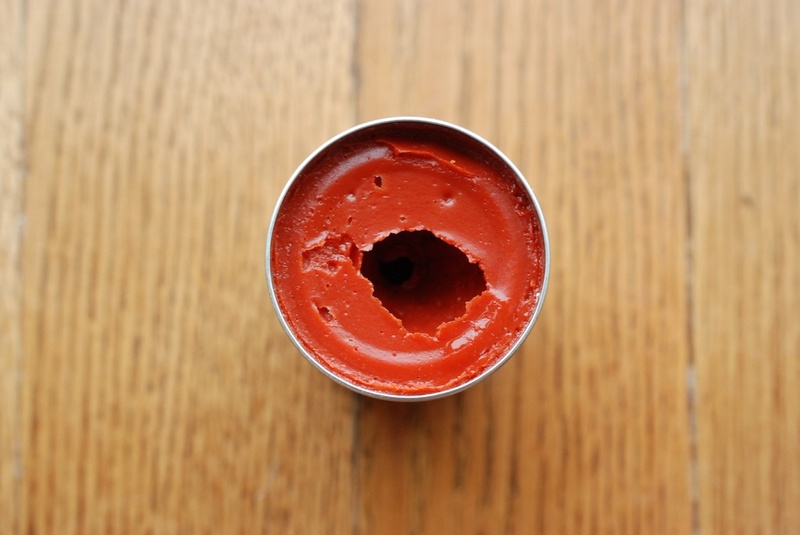 Now leave the pot alone for 2-3 minutes, so that the tomato paste concentrates a little. 7. Add the red wine, and stir to mix it into the vegetables/tomato paste. Add the chicken stock and diced tomatoes, as well as the rosemary, the thyme, the bay, and the fennel seeds. Stir to bring everything together. Raise the heat to medium-high, and let the liquid come to a gentle bubble. Once it has, turn off the heat. 9a. 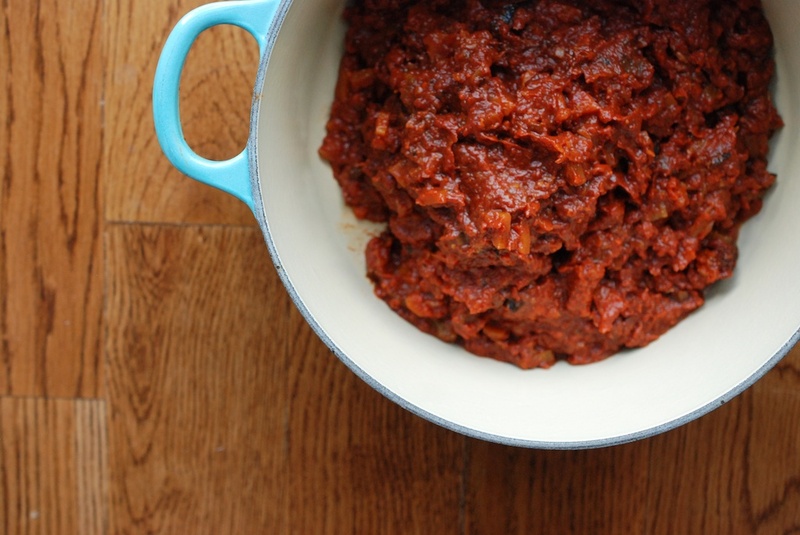 If you can (and this is really best), move the Dutch oven to the fridge overnight. This will give all the flavors a chance to meld and settle into themselves. 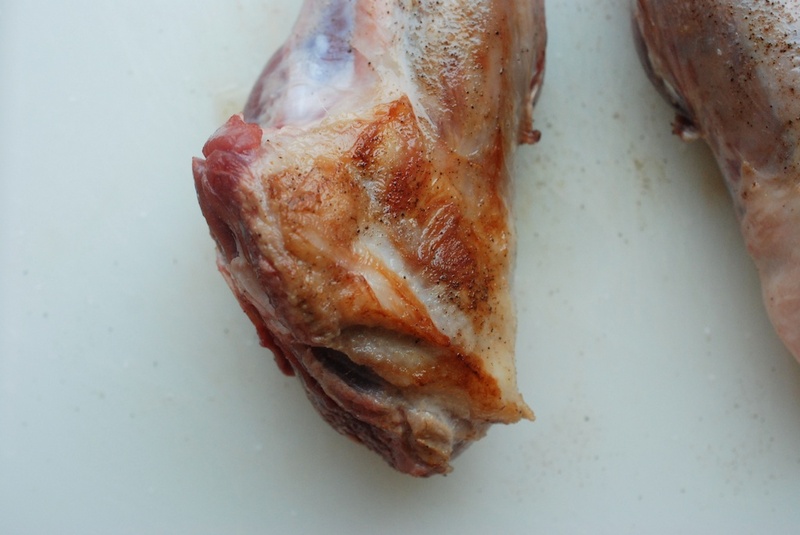 The next day, skim any excess fat from the top, and remove the lamb shanks to a plate. Heat up the sauce on the stovetop (I transfered the sauce to another pot, to avoid the burnt ring around the edge) over medium-low heat. Discard the herbs. 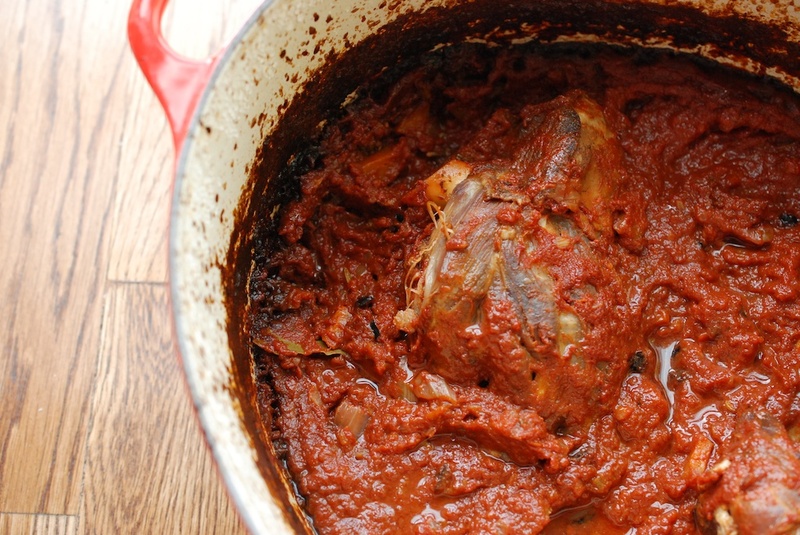 While the sauce is warming, use your fingers to shred the meat off the shanks; remove any fatty bits. 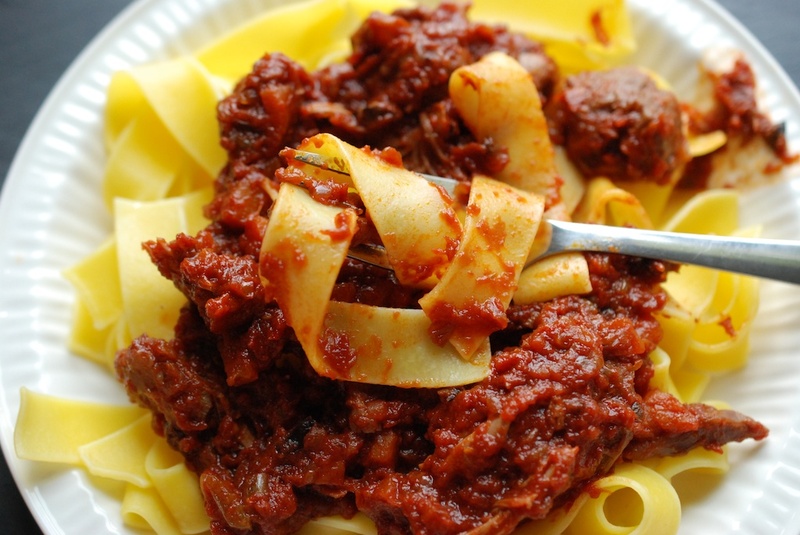 When the sauce is warm, add back the lamb pieces and keep the ragu over the heat just long enough to warm the lamb. Adjust the seasoning as you see fit (I added about 1/4 teaspoon of sea salt). 9b. If you are strapped for time, remove the lamb shanks from the pot, and set them aside, covered with foil. Let them rest for about 15 minutes. Meanwhile, continue as suggested in 9a. 10. 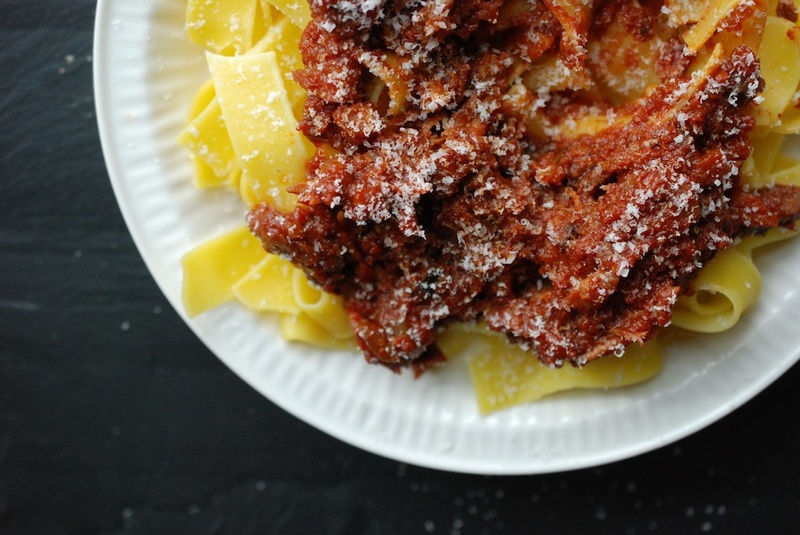 Just before you are ready to serve, cook the pappardelle in salted water, until al dente. Drain, and gently stir the last tablespoon of butter into the pasta (you don’t want the pasta to break). 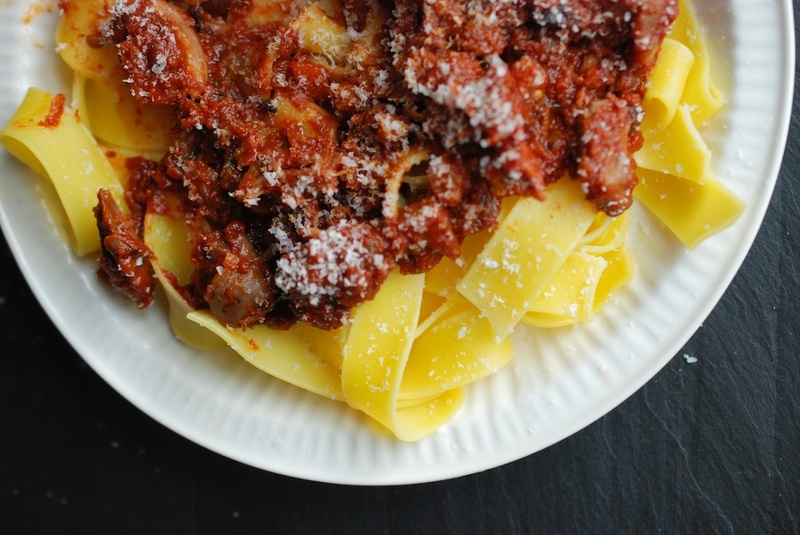 Divide the pasta among plates, and cover each generously in lamb ragu. 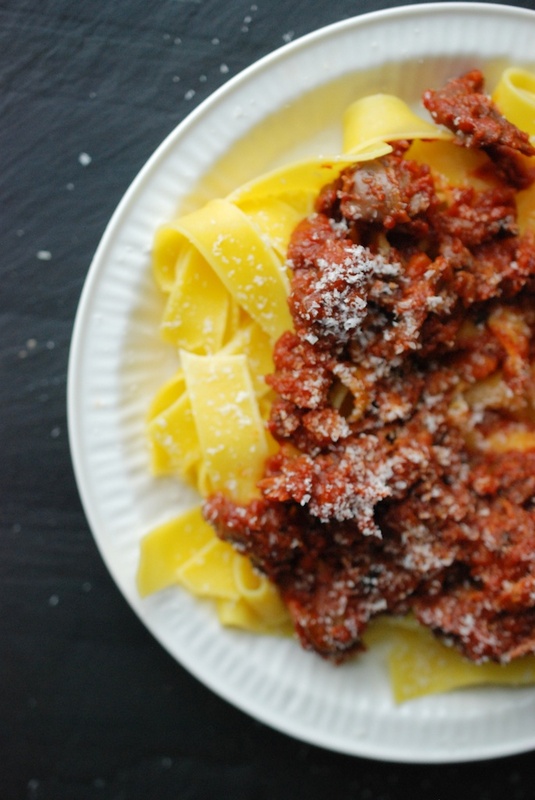 (Personally, I like there to be almost more ragu than pasta on the plate, but serve according to your own preferences.) Shower each plate generously with (freshly grated) Pecorino cheese. You can also chop up some parsley, if you like. Enjoy hot. 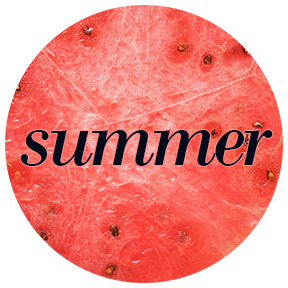 My mouth is watering – this is perfect for the season! I saw you photo over on FoodGawker and had to come and say hello. This looks so delicious, I want to pick up that fork and dig right in. I enjoyed your story about the farm visit, too. I’m in L.A., so seeing snow was fun. Great recipe! 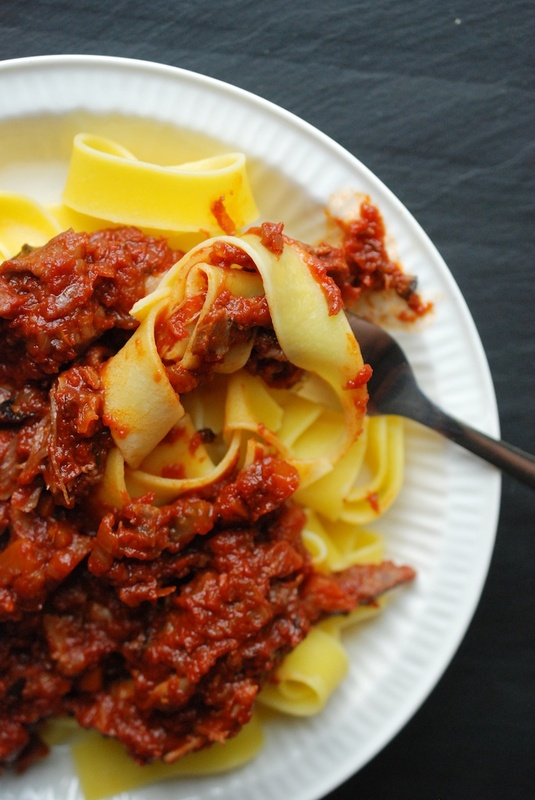 I made a slightly modified version of this — my local halal butcher only had lamb shanks in pieces (similar to osso bucco) so I used that instead of two large pieces. The cooking time was the same. The only difference is the time it would have taken; it would have been much easier just to peel the meat from a larger piece of shank. Also, I omitted olives (didn’t have any) and fennel seeds (ditto). Lastly I had a can of whole plum tomatoes on hand instead of diced, but all in all that didn’t make a difference as the long oven time broke down the whole pieces really well. Served on top of rigatoni and fresh grated parm. Would definitely make it again. Followed the recipe precisely and the results were fantastic. Highly recommend! Just made this for the family – outstanding! I didn’t have black olives but I did have a little jar of ground black truffles so that was a happy substitution. Omitted the fennel seeds because I didn’t have those either. Fabulous meal, great recipe! Thanks for your message, Terry! I’m so glad you’re liked it!